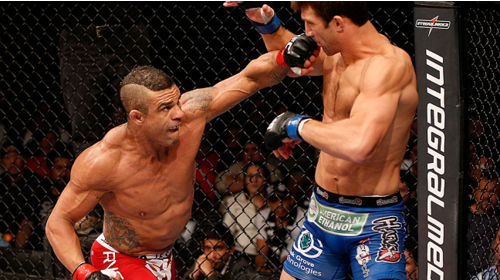 Aged 18 and minutes away from his first pro fight, Vitor Belfort was already nervous about facing the infamous cheat Jon Hess. 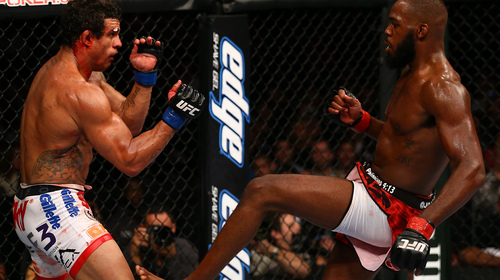 But then Hess - already been banned for life from UFC - demanded low-blows, eye-gouging and biting be allowed. 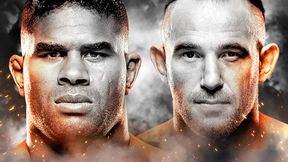 Fightography: Vitor Belfort Feb 17, 2015 (6:43) It was 1996 when Vitor Belfort, aged only 18, accepted a dangerous fight with Jon Hess – a giant of a man who’d been banned from the UFC after using low blows and eye-rakes. Moments before the fight, Hess’s representatives insisted the contest now be fought with no-holds-barred - specifically demanding that low blows, attacking the eyes and biting be legal. Belfort’s legendary trainer, the irrepressible Carlson Gracie, told Team Hess to bring a gun if they wanted… Belfort picks up the story in this Fightography. 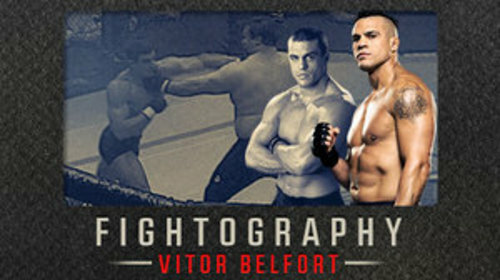 Vitor Belfort vs Tra Telligman UFC 12 Feb 7, 1997 (9:28) At 19 years old and with only one pro MMA bout under his belt, Vitor Belfort made his historic debut entering the Octagon against a fellow UFC debuter in Tra Telligman, a member of Ken Shamrock’s famed Lion’s Den gym. Vitor Belfort vs Scott Ferrozzo UFC 12 Feb 7, 1997 (14:35) It was “speed vs. size” in the UFC’s heavyweight tournament final as the fast and powerful hands of 19 year old Vitor Belfort met the immovable mass of 3-1 Octagon veteran Scott Ferrozzo. Vitor Belfort vs Tank Abbott UFC 13 May 30, 1997 (3:54) After winning the UFC 12 heavyweight tournament at the mere age of 19, Vitor "The Phenom" Belfort returns to the Octagon to face veteran brawler Tank Abbott. Vitor Belfort vs Joe Charles UFC 15.5 Dec 21, 1997 (10:41) The event’s lone heavyweight superfight saw massive Octagon veteran and judoka Joe Charles take on “The Phenom” Vitor Belfort who was returning to the cage for the first time since losing to Randy Couture at UFC 15. Kazushi Sakuraba vs Vitor Belfort PRIDE 5 Apr 29, 1999 (27:24) Making his PRIDE debut, UFC 12 tournament winner “The Phenom” Vitor Belfort, with all six of his MMA wins by ultra-quick finishes, took on Japanese pro wrestler turned MMA submission ace Kazushi Sakuraba, who won UFC Ultimate Japan’s tournament. Vitor Belfort vs Gilbert Yvel PRIDE 9: New Blood Jun 4, 2000 (30:29) After a disappointing PRIDE debut, UFC 12 tournament winner “The Phenom” Vitor Belfort, with his fast & furious striking, entered the ring for redemption as he faced Muay Thai machine Gilbert “The Hurricane” Yvel, who had 20 of his 22 career wins end by KO/TKO. Vitor Belfort vs Daijiro Matsui PRIDE 10: Return of the Warriors Aug 27, 2000 (29:25) Following his first win in the PRIDE ring, UFC 12 tournament winner “The Phenom” Vitor Belfort, with his 7-2 pro record, would put his scintillating striking against the unorthodox attack of catch-wrestler Daijiro “The Japanese Tank” Matsui. Vitor Belfort vs Bobby Southworth PRIDE 13: Collision Course Mar 25, 2001 (5:39) One of the most dangerous strikers on the planet, Vitor 'The Phenom' Belfort went up against powerful wrestler Bobby Southworth at PRIDE 13 - Collision Course. Vitor Belfort vs Heath Herring PRIDE 14: Clash of the Titans May 27, 2001 (31:06) Enjoying a three straight win inside the PRIDE ring, UFC 12 heavyweight tournament winner “The Phenom” Vitor Belfort, with his fast punches & slick submission skills, took on “The Texas Crazy Horse” Heath Herring, who had scored four straight stoppages in PRIDE. Chuck Liddell vs Vitor Belfort UFC 37.5 Jun 22, 2002 (33:40) In the night’s main event, a UFC light-heavyweight title shot was on the line as the 10-1, Kempo karate striker Chuck “The Iceman” Liddell, who was amidst an eight fight win streak, went up against the returning knockout artist “The Phenom,” Vitor Belfort. 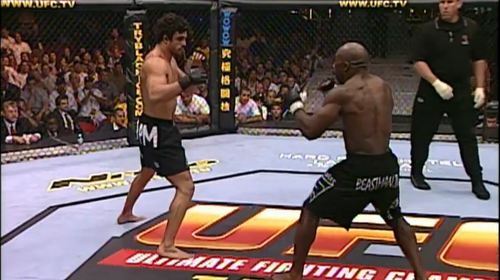 Vitor Belfort vs Marvin Eastman UFC 43 Jun 6, 2003 (3:57) Former kickboxer and collegiate wrestler Marvin Eastman made his UFC debut against Brazilian Jiu-Jitsu specialist Vitor Belfort. Vitor Belfort vs Randy Couture UFC 46 Jan 31, 2004 (8:30) Coming off of an impressive first round knockout over Marvin Eastman, Vitor Belfort had his eyes on the belt as he took on UFC Light Heavyweight Champ Randy 'The Natural' Couture. Tito Ortiz vs Vitor Belfort UFC 51 Feb 5, 2005 (33:12) In the non-title bout main event meeting of former UFC champions, Tito Ortiz, who got back on the winning track in his last outing, aimed to continue his momentum against Vitor Belfort, who was making his first Octagon appearance since dropping the light-heavyweight title. 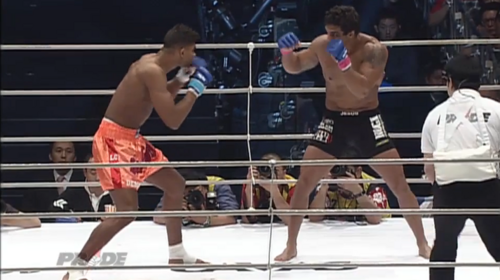 Alistair Overeem vs Vitor Belfort PRIDE: Total Elimination 2005 Apr 23, 2005 (13:19) Alistair Overeem took on Vitor Belfort in the first round of the Pride Middle Weight Grand Prix in this classic fight. 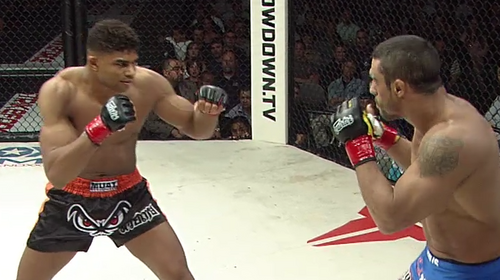 Alistair Overeem vs Vitor Belfort Strikeforce: Revenge Jun 9, 2006 (27:32) In a rematch of their PRIDE middleweight Grand Prix bout, Dutch-English kickboxer Alistair “The Demolition Man” Overeem, with his 23-7 pro record with 0 wins by decision, took on former UFC light-heavyweight champ Vitor Belfort, who possessed serious one-punch KO power. Vitor Belfort vs Kazuo Takahashi PRIDE: Critical Countdown Absolute Jul 1, 2006 (4:31) Dealing with a cold streak, former UFC light-heavyweight champion “The Phenom” Vitor Belfort needed to get back on the winning track as he took on journeyman Japanese MMA veteran Kazuo Takahashi, who owned a 28-19-3 pro record. Vitor Belfort vs Terry Martin Affliction: Banned Jul 19, 2008 (18:49) The Phenom Vitor Belfort took on fellow KO specialist Terry Martin, a UFC veteran in his own right. Vitor Belfort vs Matt Lindland Affliction: Day of Reckoning Jan 24, 2009 (19:04) Vitor 'The Phenom' Belfort had been on a tear since his decision loss to Dan Henderson nearly three years earlier, stringing three consecutive wins together, two by way of knockout. He faced struggling MMA veteran Matt lindland, who had won just once in the previous three years. 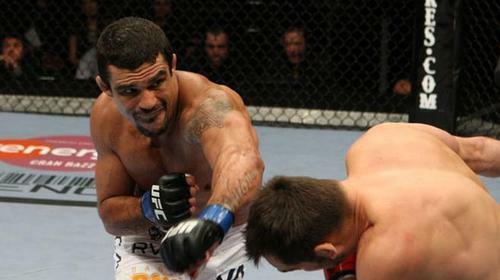 Vitor Belfort vs Rich Franklin UFC 103 Sep 19, 2009 (18:52) Brazil's Vitor Belfort, a vet of the fight game, was trying to set up the best win streak of his career with 3 of his last 4 wins coming by way of KO or TKO. Looking to put a stop to this was former middleweight champ Rich Franklin, who owned a 27-4 record. Vitor Belfort vs Yoshihiro Akiyama UFC 133 Aug 6, 2011 (16:25) After winning five fights in a row, Vitor Belfort’s win streak was snapped by the middleweight Champion Anderson Silva at UFC 126. Belfort wanted another title shot and standing in his way was Yoshihiro Akiyama, who wanted to climb the ranks himself. 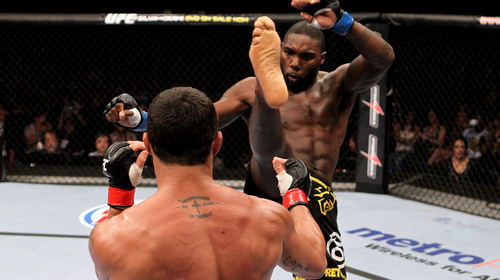 Vitor Belfort vs Anthony Johnson UFC 142 Jan 14, 2012 (17:09) Light heavyweights collided as BJJ specialist and former UFC champion Vitor Belfort took on Anthony Johnson, a member of the Blackzilian team. Vitor Belfort vs Dan Henderson II UFC Fight Night Nov 9, 2013 (19:32) Two future Octagon hall of famers met in the main event at UFC Fight Night Goiania when former UFC light heavyweight champ Vitor Belfort squared off with former Strikeforce and PRIDE FC champion Dan Henderson.